I am in Cappadocia (Καππαδοκία) in Central Anatolia for the next few days, spending the rest of Easter week in an area of ancient Christian, achaeological and geological heritage. Ancient Cappadocia is spread across the provinces of Nevşehir, Kayseri, Aksaray and Niğde Provinces in present-day Turkey. This is a region of exceptional natural wonders, known in particular for its “fairy chimneys” and its unique historical and cultural heritage. I left Dublin on Sunday evening [5 April 2015], and I had a short overnight stay in Istanbul before catching an early morning flight to Nevşehir Cappadocia Airport and travelling on to Göreme. 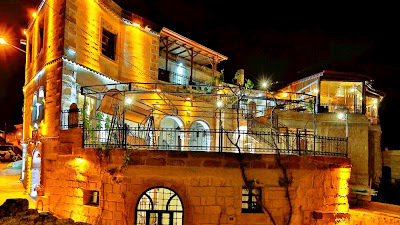 I am staying in the Maccan Cave Hotel in Göreme, a cave hotel with traditional décor in the arched rooms and a garden and a rooftop terrace with panoramic city views. The hotel takes its name from one of the ancient names for Göreme (Greek Κόραμα). In the past, the town has also been known as Korama, Matiana, Maccan or Machan, and Avcilar. The Göreme National Park was added to the Unesco World Heritage List in 1985, and when the Göreme Valley nearby was designated an important tourist destination and a centre for tourism in Cappadocia, the name of the town was changed to Göreme. Göreme, with a population of about 2,500 people, is located among the “fairy chimney” rock formations of Cappadocia. After the eruption of Mount Erciyes about 2,000 years ago, ash and lava formed soft rocks in the Cappadocia Region, covering a region of about 20,000 sq km. The softer rock was eroded by wind and water, leaving the hard cap rock on top of pillars, forming the present-day “fairy chimneys.” The people of Göreme realised that these soft rocks could be easily carved out to form houses, churches, monasteries. Göreme was first settled in the Roman period, and the many surviving rock churches are evidence of the prevailing presence of early Christianity. Göreme’s historically important sites include the Ortahane, Durmus Kadir, Yusuf Koc and Bezirhane churches, and the richly decorated Tokali Kilise, the Apple Church, and a number of homes and pigeon houses carved straight into the rock formations. These churches have many examples of Byzantine art from the post-iconoclastic period, and their frescoes are a unique cultural and religious heritage from that period. I hope to learn more about these fairy chimneys, Byzantine churches and the history of Cappadocia, and to gain some first-hand knowledge of the Cappadocian Fathers and the Patristic writers in the coming week. Why not join me on this journey as try to blog day my day and share these experiences? You might even find yourself joining me on a hot-air balloon.